After taking a quick shower, we discussed on what to eat before meeting up with Dean and a few more friends that are based in Pattaya. Zach told me about this burger joint that he ate before and really liked it. 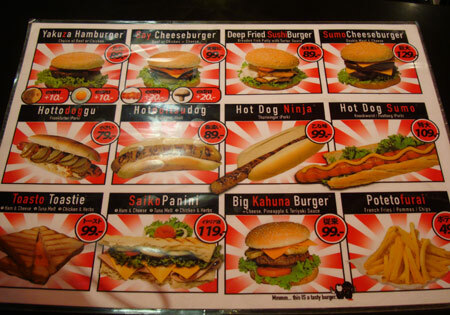 The name of the burger joint is Yakuza Burger. Zach knows very well that I’m not into fast food or fancy restaurant that served Western cuisine. Since we have been eating Asian food all the time, maybe is time to be considerate and let Zach eat some farang(white folks in Thai ) food. After all the burger joint is just a little booth and not a fancy restaurant. 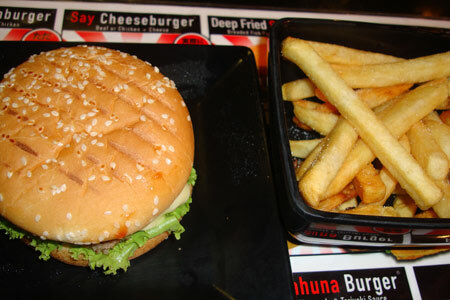 So Yakuza Burger it is for tonight. Four Season Place hotel provide transport for the guest around Pattaya town. We took the free transport that is a special designed tuk tuk to go to Walking Street. The ride was just 10 minutes. Walking Street is a popular destination for many tourist around the world. It is famous for bars and also Thai bargirls. Since this is a PG13 blog, no bars reviews are allowed here. I actually kinda glad that we ate burgers for that night. Sometimes is good for the stomach to take a break from all the spiciness. To me, burgers are mild in terms of taste. It lacks the punch like most Asian cuisine which uses a lot of spices. 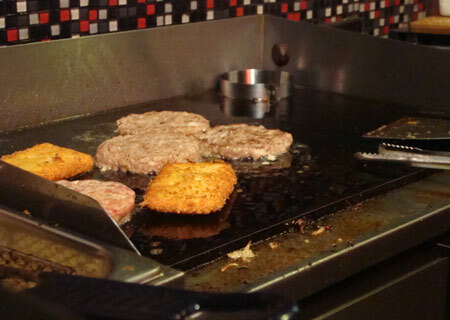 The key to make a good burger lies on the beef patty in my opinion. The meat gotta be juicy with some fats in it. 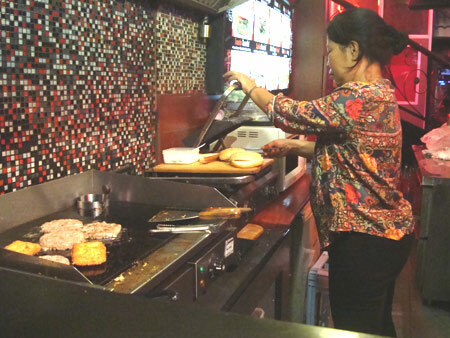 I’ve no idea what is used to marinate the beef patty but my guess is 2-3 different spices. Then you need to serve it with fresh bread that is not dry, lettuce, tomatoes, onions and cucumber. I’m sure getting fresh fresh lettuce, tomatoes and so on is a no brainer. So comparatively, making a good burger is easier than making a good curry or Tom Yum soup. That’s just my opinion anyways. Don’t mind me if you are into burgers and not Asian cuisine. But for the record, I did enjoy Yakuza Burger. Yakuza!!!!! I love this place when I’m in that greasy-foods-mood!